The Night Before Christmas (1951 film). Russian literature has been frequently adapted for the screen. Over the years, the novel "Anna Karenina" has been made into about 20 different film interpretations, by directors from around the world, and Akira Kurosawa made a Japanese version of Fyodor Dostoyevsky’s "The Idiot." RBTH investigates the rarely encountered but brilliant animations inspired by classic Russian books and poems. Nikolai Gogol’s Vyi is almost too scary to even read, let alone watch. 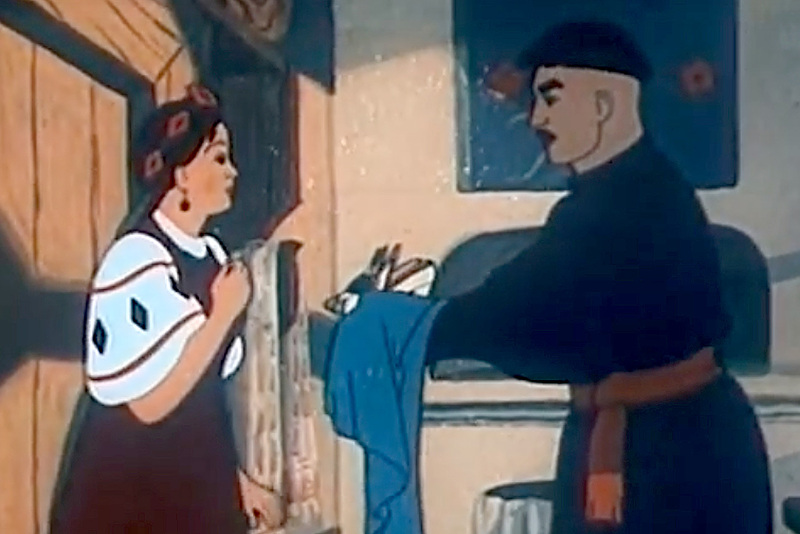 Yet, this tale of a priest who has to hold a three-day funeral service for a young girl has been adapted several times, including Soviet and Russian versions and several animations. This funeral would have been ordinary, except that the dead girl suddenly wakes up as a witch and calls on her devilish friends and ghouls to form a coven. Vyi is the name of their leader, who is both the most frightening and ugliest of them all. This is another Gogol story and is not scary but is instead cheerful, though not lacking in mysticism. One of the main characters is a small imp who arrives in a village on the night before Christmas, steals the moon and drops in to visit a woman. Suddenly, the woman’s son returns home distraught because the woman he loves has denied his marriage proposal. He captures the imp and makes him fly to St. Petersburg to ask the empress for the shoes the woman he loves had wanted. Animation is the best way to screen a fairy tale, so of course there are several cartoons based on Pushkin’s work. One of the best is The Tale of Tsar Saltan, or as the full title goes, The Tale of Tsar Saltan, of His Son the Renowned and Mighty Bogatyr Prince Gvidon Saltanovich, and of the Beautiful Princess-Swan, a tale of magic, love and adventure. Murmured: "Why so far, Guidon? I am that princess, my dear." O'er the waves towards the shore. Source: YouTube / woodgeor v. Click here for part 2. This great initiative came from Kingston University students competing for an animation prize. The students transformed classic Russian novels into short trailers. The winner was the creator of the bloody, 40-second trailer for Boris Pasternak's famous novel Doctor Zhivago. Vasily Grossman’s Life and Fate, Mikhail Bulgakov’s Master and Margarita and many more works were also animated and received prizes. This example is not a film adaptation of a classic novel. This 50-minute movie is an animated documentary of the biography of the repressed poet Osip Mandelstam. A popular rap singer Noise MC, recorded a soundtrack for the movie using Mandelstam’s poem “Save my speech forever,” which was also the title of the movie. A slightly hysterical voicing of the poet (performed by Russian actor, Viktor Sukhorukov) and puppet-style hyperbole are used to demonstrate the awful situation of creative people who lived under Stalin’s regime and were sometimes censored, sent into exile, banned from publishing and even killed. The director Roman Liberov has already made films about the life and work of other Russian writers including Ilya Ilf, Yevgeny Petrov (also animated), Joseph Brodsky and Sergei Dovlatov. If you can watch this animation without crying, you must be pretty cold hearted. This is the story of a deaf and mute peasant named Gerasim who calls his dog “Mumu” because these are the only sounds he can make. However, his landlady forces him to kill the dog because it barks too loudly and keeps her awake at night. Gerasim drowns the dog in the river by tying bricks around its neck. This story is considered to be the first romantic plot found in Russian literature. As is typical in tales of sentimental romance, love cannot be simply happy. In this story, a girl from a poor family named Liza falls in love with a rich man. They have long dates strolling through the birch trees, where they innocently hug and kiss. However, the man must leave to join the army and admits to Liza that he is already engaged. Liza cannot live with this and throws herself into the river. Bulgakov is famous for his rich imagination as demonstrated in his tale of a devil and his cohort in 1920’s Soviet Moscow, The Master and Margarita, or the tale of what happens when the brain of a stray dog is put into a human’s head in The Dog’s Heart. In this story, Bulgakov imagined a professor who carries out a sensational experiment where he increases the size of insects using heat rays. Eventually, these giant insects attack the city and the people must fight them… This animation has the title Well Forgotten Old.